A urine test after being stopped for DUI suspicion can be embarrassing and time-consuming for any driver. At Kramer Law, a knowledgeable Orlando DUI attorney will research whether any laws were violated when our client was stopped for DUI and subjected to a urine test. The officer may ask a driver to take a urine test after the driver has already taken a Breathalyzer test to measure blood alcohol concentration (BAC). A driver may also be asked to take a urine test if he or she refused another form of DUI testing or was involved in an accident or taken to the hospital. Several factors could influence the accuracy of the test. An experienced DUI attorney will know for sure how to challenge the scientific evidence and fight for the exclusion or dismissal of a DUI charge altogether. Contact us today for a free consultation. A urine test is one of three chemical tests that Florida officers use to measure a driver’s BAC. The legal BAC in Florida is .08. If your BAC is higher than .08 based on a urine test, you will likely be arrested for DUI. It is important to note that DUI does not just apply to drinking alcohol. An officer may use a urine test if there is suspicion of drugs or a drug and alcohol combination that could impair the ability to drive. Among the drugs a urine sample can trace are cocaine, heroin, marijuana, pain pills, and medication. A Florida officer usually administers a urine test if a driver blew less than .08 or if the officer believes the driver could be impaired by a chemical or controlled substance. A screening process called “immunoassay” usually evaluates a urine sample to see if any controlled substance is present. It may take a Florida officer up to 20 minutes to get a reading after the sample has been submitted. 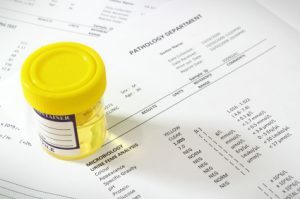 A urine sample does not always – if ever – show an accurate presence of controlled substances. A urine test instead shows a drug’s “metabolites,” which are the trace chemicals that remain in the body after the drug substance has been broken down. The seasoned Orlando DUI attorneys at Kramer Law know that a urine test is not typically a strong indicator of DUI, especially if the prosecutor cannot use the sample’s results to prove the driver was impaired at the time of the arrest. The implied consent law in Florida says that every person with a valid Florida driver’s license has basically already consented to chemical testing if he or she is stopped for suspicion of DUI. There could be consequences, including a license suspension, for refusing to take a urine test. Still, refusing a test might give the prosecution less evidence to build a case. If you have failed or refused a urine test in the Orlando area, Kramer Law can guide you on what may be in your best interest in court. You can reach us today. Call 855-Kramer-Now (855-572-6376).